Don’t expect big planting rally with so much corn around. 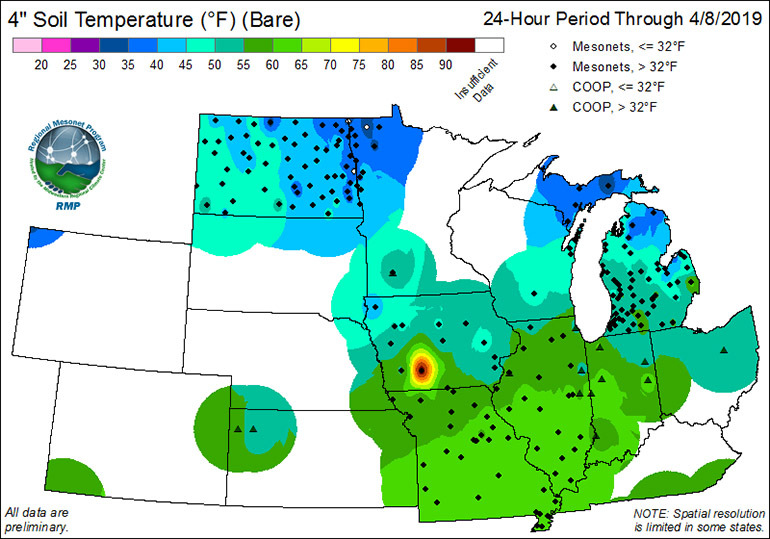 With temperatures finally start to warm soils in the Corn Belt, tractors should be moving. They aren’t, and planting delays could be the best hope for a rally over the next month or so. Don’t expect much more than short covering, because old crop inventories should top 2 billion bushels at the end of the 2018 crop marketing year Aug. 31. That carryover will be a hangover for the market until and unless a serious weather threat emerges this summer. To be sure, most folks have tossed USDA’s March 29 prospective plantings of 92.8 million acres out the window. But even if 2 million acres don’t get planted this spring, all it would do is get rid of the extra bushels the agency found in its March 1 stocks survey. 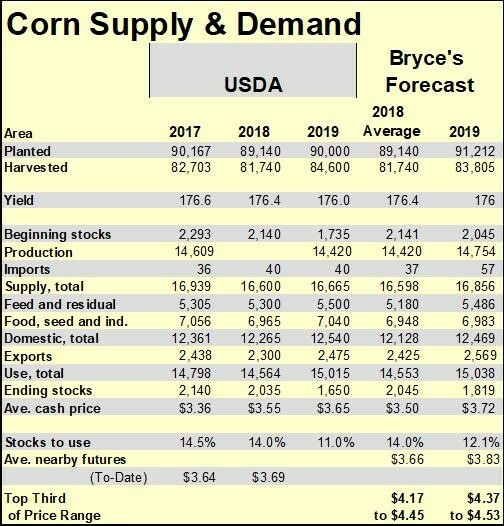 USDA typically uses its March plantings number in its first monthly supply and demand report for new crop put out in May. If that trend continues, the May forecast for 2019 crop stocks to use could easily top 13%, a historically burdensome level that suggests modest expectations for any spring rally. There’s fuel for a rally if the market can find a spark. Big speculators built up a record bearish bet in corn ahead of the April 8 reports. So short covering could trigger additional gains. But if the market does rally, there will be sellers, too, as elevators buy corn from farmers finally unloading some bushels. End users have been buying all along, taking advantage of what were clearly very cheap prices, and their needs may be covered, especially for old crop. Seasonal charts give July hope for perhaps a rally back to $3.90 or so as a best-case scenario for now. 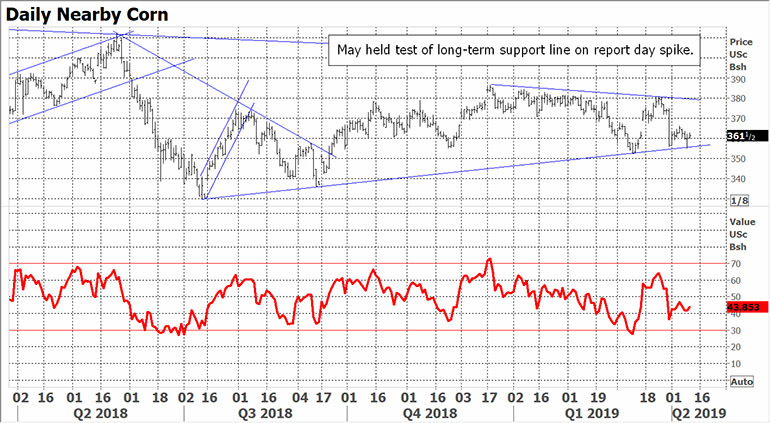 May broke through its downtrend for the past week, after holding the long-term support line on the nearby continuation chart despite making a new daily contract low after the April 9 numbers hit. But start selling basis July $3.80 or on a weekly basis to make sure too much inventory isn’t held into summer. All those April rains may delay planting for now. But they make it that much more difficult to talk about drought unless weather turns very hot during pollination. That can happen in a hurry, but not until the days are much longer. Ultimately, a return to average or lower yields could generate some rallies to profitable levels. When that will happen, is the big question. With the average cost of production for new crop corn around $4, it’s tough to argue sales at loss of $65 an acre or more. Those who feel compelled – or have a low cost of production – can consider the July 2020 for hedges. 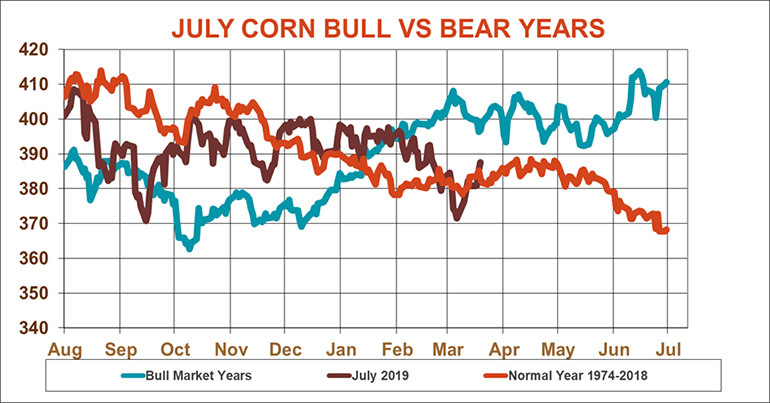 Carry continues to trade near highs reached for the 2018 as the market anticipates the impact of increased storage charges for grain in deliverable position for March 2020 and beyond. Even with lower acreage and average yields, only a model reduction in carryout could be seen in the coming year. Prices could still rally on weather scares, however. Soil temperatures are warming, but fields remain too wet to plant for now. Big speculators built up a record bearish bet in corn ahead according to last week’s Commitment of Traders, providing room for a short-covering rally. The seasonal trend chart for July futures shows hopes for a rebound but also suggests a rally to $3.90 could be the best to hope for this spring. Nearby corn held the support line fall and winter lows despite a new contract low April 9 by the May futures contract. Senior Editor Bryce Knorr first joined Farm Futures Magazine in 1987. In addition to analyzing and writing about the commodity markets, he is a former futures introducing broker and is a registered Commodity Trading Adviser. He conducts Farm Futures exclusive surveys on acreage, production and management issues and is one of the analysts regularly contracted by business wire services before major USDA crop reports. Besides the Morning Call on www.FarmFutures.com he writes weekly reviews for corn, soybeans, and wheat that include selling price targets, charts and seasonal trends. His other weekly reviews on corn farming, basis, energy, fertilizer and financial markets feature price forecasts for key crop inputs. A journalist with 38 years of experience, he received the Master Writers Award from the American Agricultural Editors Association. For more corn news, corn crop scouting information and corn diseases to watch for, follow Tom Bechman's column, Corn Illustrated Weekly, published every Tuesday.